In recent years, business forecasts have had to become faster and more flexible—ready to be adjusted at a moment’s notice. As earnings and product cycles accelerate, it has become clear that the business world is decisively moving towards treating rolling forecasts as standard. 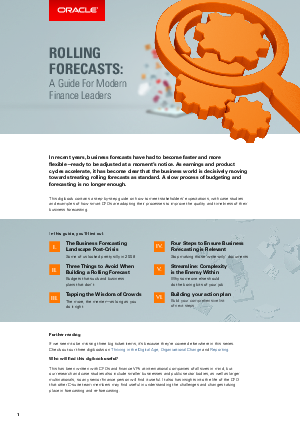 A slow process of budgeting and forecasting is no longer enough. This digibook contains a step-by-step guide on how to meet stakeholders’ expectations, with case studies and examples of how smart CFOs are adapting their processes to improve the quality and timeliness of their business forecasting.